Three (3) ALS from Major Greenleaf Dearborn to General Henry Alexander Scammell Dearborn, including Second Seminole War. 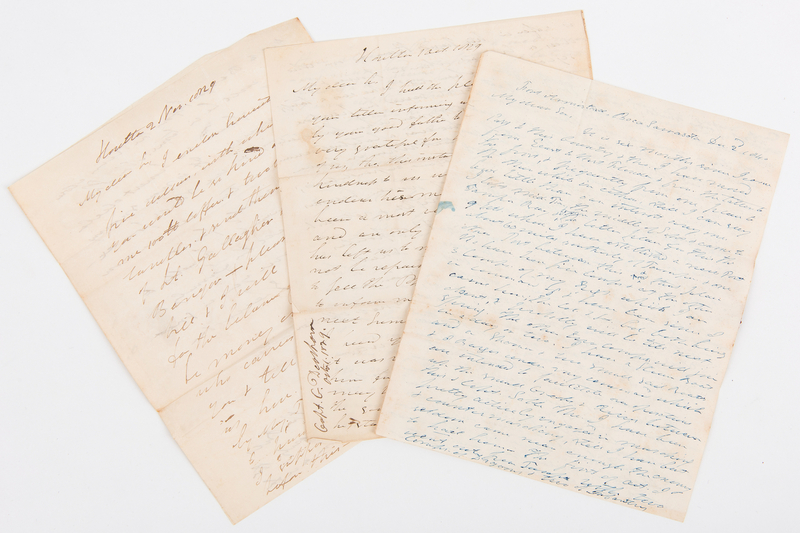 1st item: Second Seminole War period ALS from Major Greenleaf Dearborn (1786-1846), Fort Armistead, Boca Sarasota, to his uncle General Henry A. S. Dearborn (1783-1851), Boston, MA, dated December 2, 1840. Greenleaf begins the letter by discussing his duties in Florida and recent occurrences with the Seminole Native Americans, stating "My dear Sir, It is six months since I came first to this country…I have moved from Eeast [sic] to West Florida…I left mid Fla. the middle of Sept & came to Tampa…I have established a new Port about 60 miles southerly of Tampa & one other Port between this [Fort Armistead] & that…I have been pretty actively engaged in marching & counter marching, still I have but seldom come near enough the enemy to hail him. The first of Oct. I went out from Tampa with two comp[anies] of Dragoons & two of Infantry about forty miles, & with the Dragoons came on an Indian encampment & beat with their quarters (? ), but they all made their escape, tho[ugh] probably we wounded some, but they move close on the edge of a Hammock & we had to dismount to follow, & they of course made their escape, leaving a poney [sic] and their Baggage. Tho[ough] we shall be very actively engaged, still I anticipate but little [fighting] as the enemy's only object is to escape & we can seldom surprise them". He also references the November 1840 meeting between General Walker Armistead and several of the war chiefs at Fort King in an attempt to persuaded them to remove to Oklahoma, stating "The Genl. had a talk with some of Tiger-Tail's [Thlocko Tustenuggee] Band, with a Delegation of the Seminole Indians from Arkansas, but they finally…took off with the three or four prisoners we had still here. The Arkansas Indians are still here". Greenleaf also discusses his opinions regarding the recent Presidential election, stating, "I have not seen a newspaper since the election of Electors but am informed that enough Harrison Electors…secure[d] his election. I could have wished that the present President might have been left out by a unanimous consent, but this would have been too much good to expect in these depraved times. It might have been expected from our present rulers, as they had come into power steeped in corruption & had served their whole term either in debauching, wheedling, cajoling & bribing the people; or in libeling, railing at, threatening & vilifying their opposers, that they would have attempted to make their exit with some degree of decency & composure; but it seems they will die & leave their ill-gotten power and offices as they have lived & executed their trusts…I believe the next Congress will be (a majority) thorough reformers I mean real reformers, not those Jackson & hypothetical (?) ones, who never took a step but what was dictated by selfishness to secure their wicked reign". 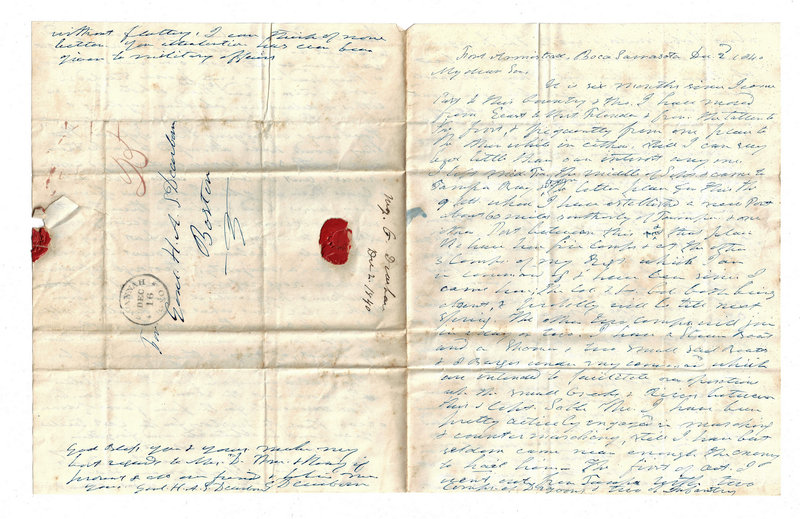 Address leaf in Greenleaf's hand with postmark stamp from Savannah, GA, dated December 16, and remnants of red wax seal either side. 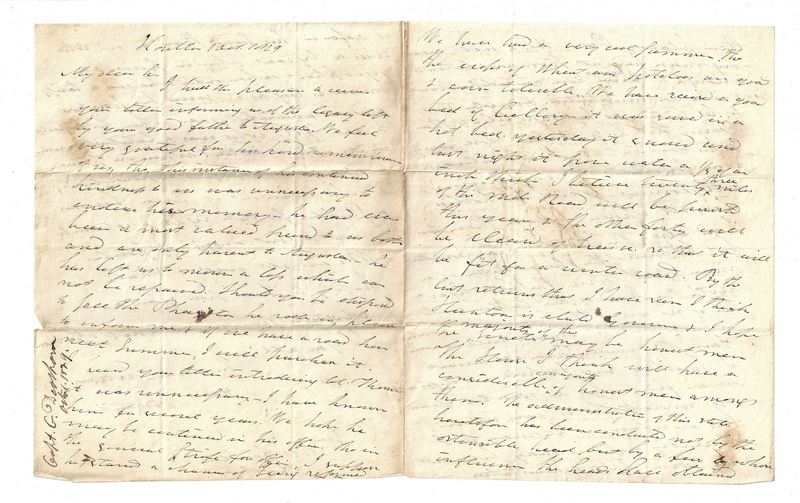 9 3/4" H x 7 7/8" W. 2nd item: ALS from Captain Greenleaf Dearborn, Houlton, ME, to General H. A. S. Dearborn, Roxbury, ME, dated October 1, 1829. Greenleaf begins the letter by referencing the recent death of Henry Dearborn, stating, "My dear h, I had the pleasure to receive your letter informing us of the legacy left by your good father [Henry Dearborn] to Augusta. 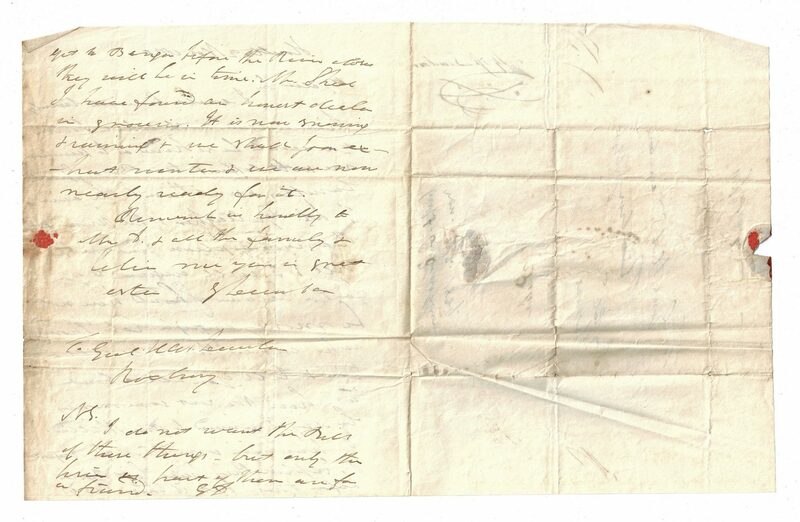 We feel very grateful for his kind remembrance of us, tho[ugh] this instance of his continued kindness to us was unnecessary to endure his memory–he had ever been a most valued friend to us both and an only parent to Augusta–he has left us to mourn a lo[s]s which can not be replaced". He discusses his opinions regarding prominent Maine politicians, writing "[Albion] Par[r]is tho[ugh] a well meaning man had not firmness & talents enough to secure him an independent & wise administration. [Enoch] Lincoln was to be pitied–he had more talents than Par[r]is, but he kept bad company & his good intentions were always soon forgotten–he was "oblivious" & "hobbyhorsical"– & even his hobbies were ill-chosen". He also discusses the recent Presidential election of Andrew Jackson and his opinions of John Quincy Adams, stating, "I presume Genl. Jackson is a different man from what he was ten years ago. No doubt he is very infirm, but as infirm as he may be I sincerely hope he may live out his term. The [country] is safer in his hands than in one who was a tyrant when in power & a sycophant when out–who was a tariff man as long as it served his purpose and an anti tariff man when he expected to gain by it". No address leaf present. 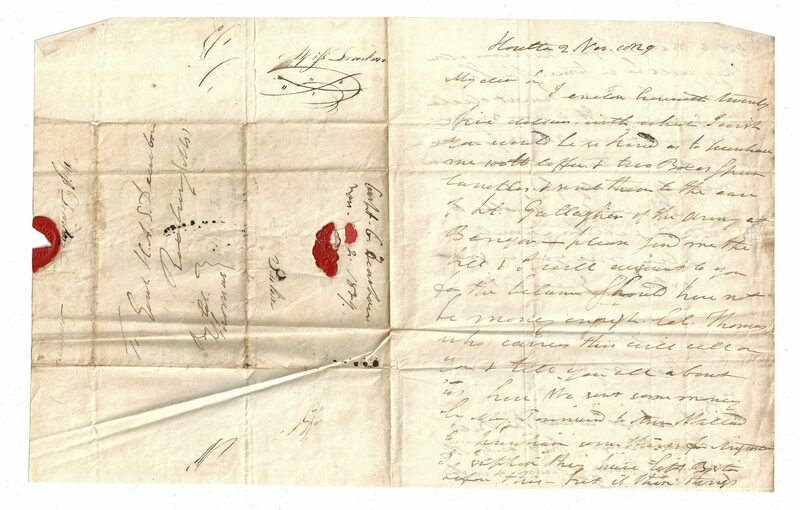 9 5/8" H x 8" W. 3rd item: ALS from Captain Greenleaf Dearborn, Houlton, ME, to General H. A. S. Dearborn, Roxbury, ME, dated November 2, 1829. 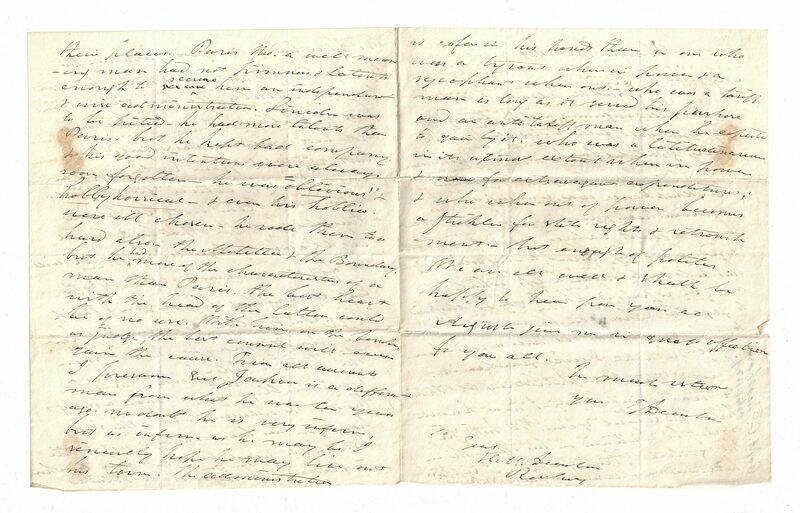 "My dear sir, I have enclosed herewith twenty five dollars, with which I wish you would be so kind as to purchase me 100 [units of measurement] coffee & two boxes [illegible] & send them to the care of Lt. [Joseph S.] Gallagher [Assistant Quartermaster] of the Army at Bangor–please send me the bill & I will [send] to you for the balance should here not be money enough. 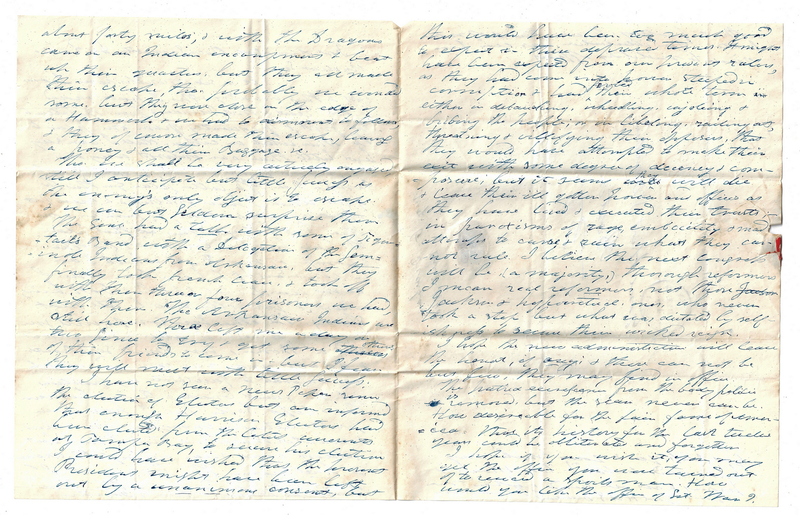 Col. Thomas [the Sutler and Mail Contractor] who carries this will call on you & tell you all about us here". Address leaf in Greenleaf's hand with remnants of red wax seal either side. 9 1/2" H x 8 1/8" W. Provenance: Descended in the family of Greenleaf Dearborn, nephew of Henry Dearborn (1751-1829). Note: Henry Alexander Scanlon Dearborn, son of General Henry Dearborn, served during the War of 1812 as a Brigadier General of Volunteers in command of the defenses at Boston Harbor. He was elected to represent Massachusetts' 10th District in the United States House of Representatives, serving from 1831 to 1833. Greenleaf Dearborn, alternate spelling Greenleif, was born in Monmouth, ME, on August 7, 1786 to Simon Dearborn, nephew of Henry Dearborn, and Molly Blake. Greenleaf married Pamela Augusta Gilman, granddaughter of Henry Dearborn, on April 2, 1822 and had 4 children. Dearborn, as Captain of the Second Regiment of Infantry, was promoted to Major by Brevet July 1, 1834, and Major of the First Regiment of Infantry, February 20, 1840. As Major he commanded troops in the Second Seminole War, including Camp Townsend, Lowndes County, GA. He passed away on September 9, 1846 in Brattleboro, VT. His daughter, Annette Maria Dearborn Boyd, great grandaughter of Henry Dearborn on her mother's side, was married to Charles Harrod Boyd; they had four children including Julia Wingate Boyd (wife of Lewis M. Coleman, Jr., a descendent of fourth U.S. Chief Justice John Marshall) . Source: "The Maine Historical and Genealogical Recorder", Vol. 3 by S.M. Watson, 1886). CONDITION: Overall good condition with foxing spots, toning, tears (primarily along fold lines), etc. to be expected from age. Greenleaf signatures in strong, clear condition.